To relax and sleep in a luxury hotel, knowing the next day ahead will lead to amazing things, is something quite nice. To come back everyday to a newly cleaned room with fresh linens, new toiletries, and fresh towels is also quite nice. The soft comforters on my bed are always welcoming and the pillows I sink into are hard to leave in the morning. I don’t like when the room service rings my doorbell in the morning, waking me up, so I press the ‘Do Not Disturb’ button near the hallway so they know to stay away. It’s hard to get up from some of the best sleep I’ve gotten in months, but the fact that the breakfast buffet is waiting for me and we have a whole day worth of exciting activities in store is all the more reason to get my lazy carcass out of bed! We immediately headed downstairs before the time slot for breakfast expired. Afterwards, we came back up to the room to formulate a game plan for the day. We both still really wanted to go jet skiing, so we searched the web for places nearby where we could accomplish this feat. 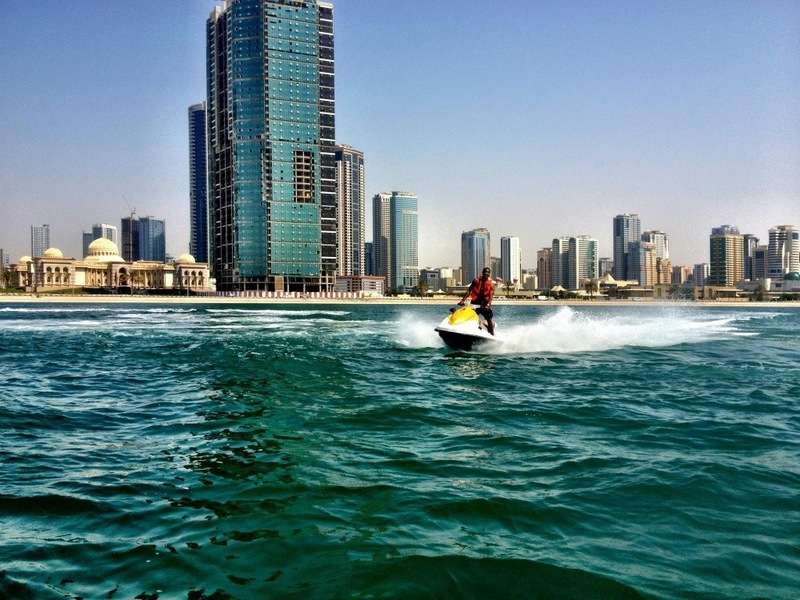 We found a jet skiing site in a city close by, just outside of Dubai called Sharjah. Let’s go there! Sharjah wasn’t too long of a drive away. We made it pretty quick and our cab pulled up to a marina that lined up to the city scape. 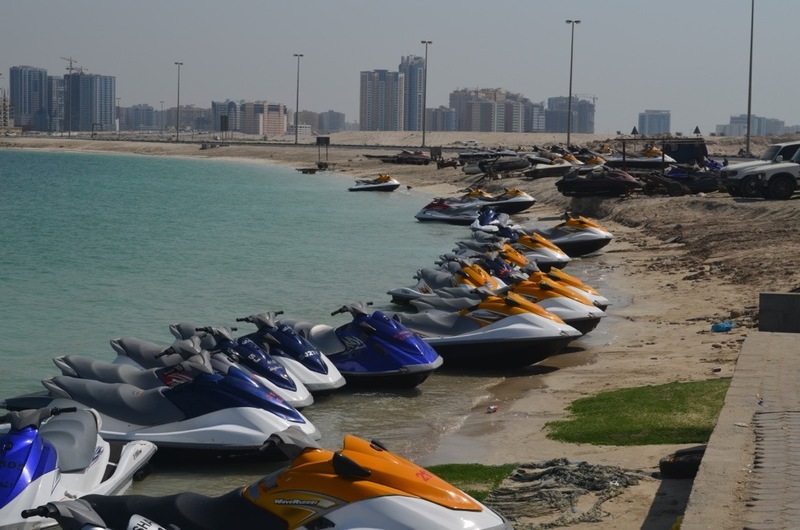 Along the shore, there was a legion of jet skis of all shapes and sizes along the beach. We went to one of the rental companies and each got our own jet. I had a yellow and white one while Chris had a gray and white one. We had the jets for a whole hour! I wore my GoPro and sped across the marina filming everything. Later on, I swapped the camera to Chris. There would be points where we would try and cut each other off with our skis and splash one another in the process! 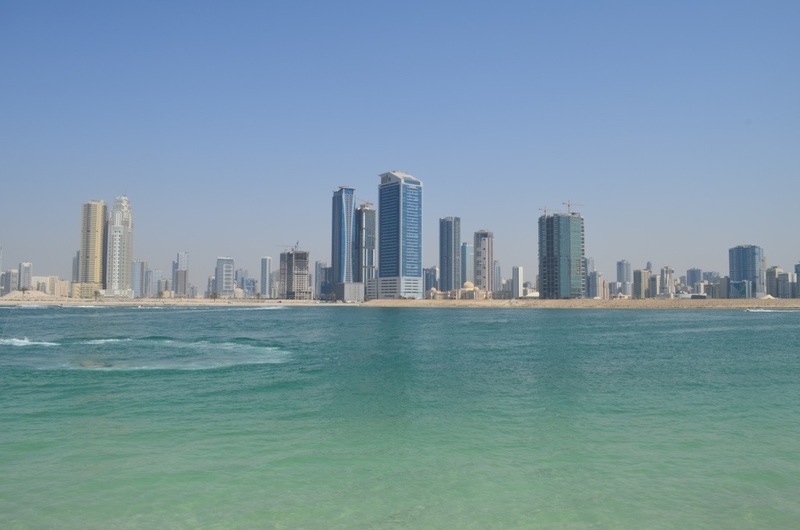 The backdrop of the marina was pretty cool; teams of skyscrapers along the beach with the sun burning high in the sky. 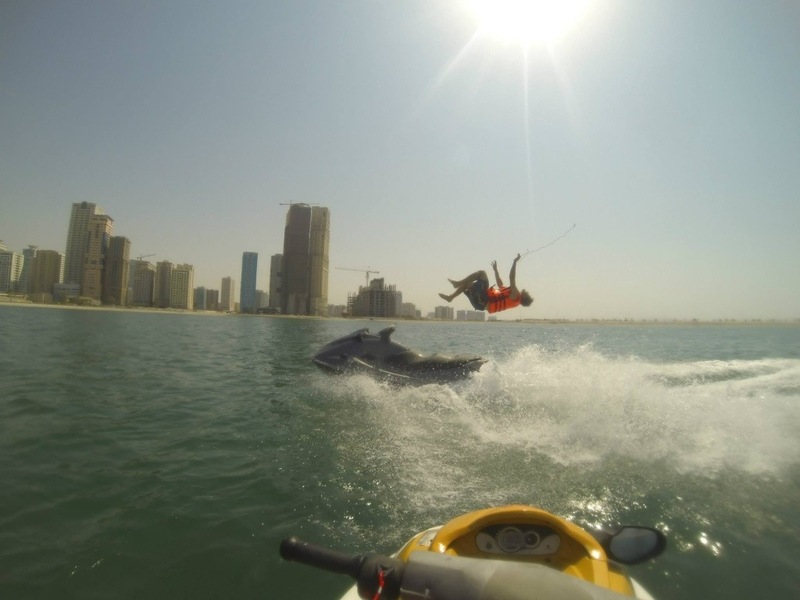 We grew a tad bored of jet skiing in circles and decided to spice things up a bit. I challenged Chris to do a backflip off of his jet while it was moving and I would capture it on camera. He rose to the challenge so we got in position for it. I turned off my jet and stayed in one spot while Chris rode pass and flipped off his ski! But, as he did this it looked like his head hit the back of his jet and all I heard was a loud “thud”! He popped back up out of the water and it turns out he bashed his knee and not his head. He cut himself up pretty badly and was bleeding all down his leg. He lost his key to the jet in the process. I rode back to the rental company and asked for another key. They charged us 200 dirhams for another key just like I expected. They warned us before riding that a lost key would cost us 200 dirhams which equals to about $60. Anyways, I gave the key to Chris and we rode back to the shore. Our time was up and we wanted to get back to Auris. 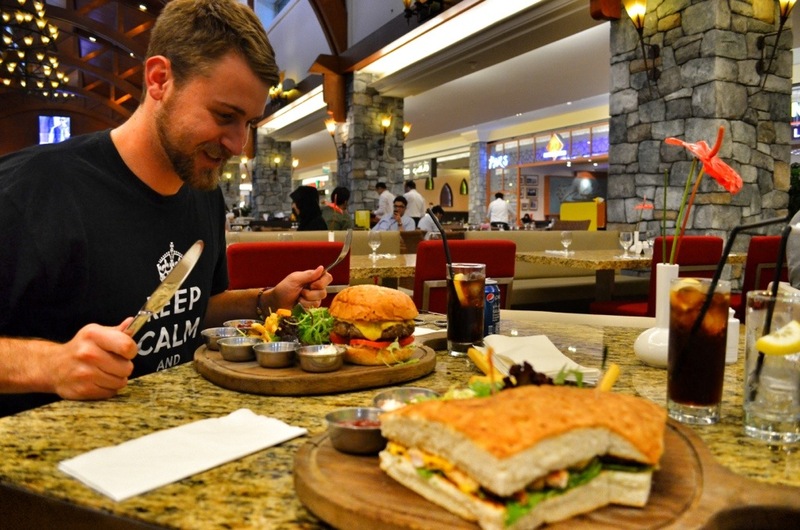 After Chris bandaged himself up, we went to the Mall of Emirates for a quick lunch. We managed to find another food court on the opposite side of the mall. We opted for Mexican food this time and I found myself ordering up tasty tacos. Afterwards we went back to Auris and lounged around. We went up to the pool to play around with my GoPro under water and came up with some really cool and creative footage! We may eventually put some of it on YouTube in the future! We knew that we would want to spend our last night in Dubai going all out and a good way to do that is by going to an extremely nice restaurant in our best clothes. I didn’t have anything great on me but a polo shirt and some dress pants with gym shoes! It did the trick though. 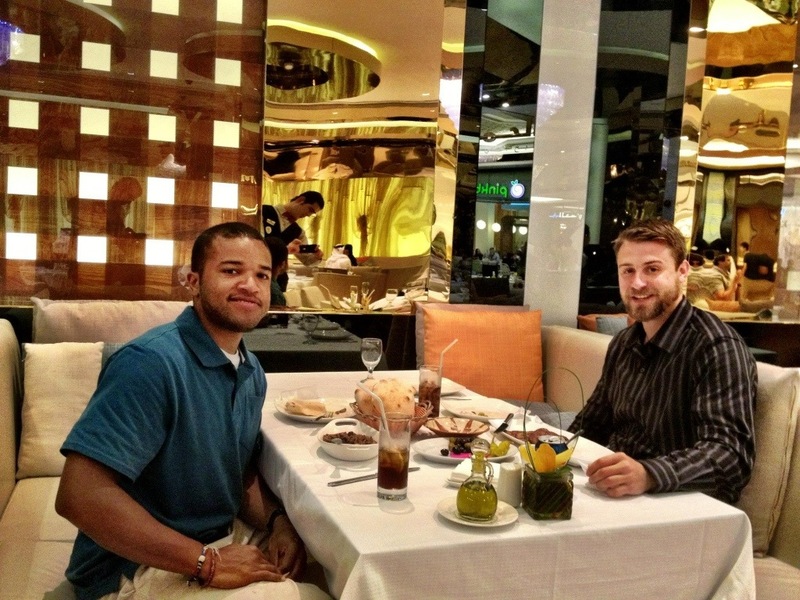 We went to a pretty nice looking Lebanese restaurant in the mall and had a whole sofa booth to ourselves! I completely expected to order up a bottle of wine but it turns out that this restaurant didn’t serve alcohol, which didn’t surprise me. I tried to order drinks at Auris a couple of nights ago but they too didn’t serve any alcohol, just ‘mocktails’. Anyways, we started off with hummus and I LOVE hummus! It came with a very light, warm, and hollow type of bread. Also with olives. All the bread we’ve been getting in Dubai gets served with olives. For my entree, I ordered up a filet dish of some sort. I’m not exactly sure because it was in arabic. When the waiter delivered my entree it was nothing like I expected. I expected a piece of filet but instead it looked more like fancy canned dog food. I still ate it and it was still pretty good! Chris’ food looked like the meat pattys you put on White Castle sliders except a tiny bit bigger but his was also still pretty good. It was Lebanese and different from anything we were used to. We came in with an open mind and got a really great meal! The desserts we had at the end of the meal made everything perfect. I enjoyed a banana split while Chris had a german chocolate cake. The german chocolate cake here was nothing like we have back at home but it still tasted pretty good. Once we got back to Auris, we went back up to the rooftop and had ourselves another shisha, but this time it was apple flavored by suggestion of the staff. Last time it was a grape mint flavor. It was a great end to a luxurious three days here in Dubai. I was going to miss my soft, big, cozy bed most of all! Dubai has been wonderful (and expensive) but worth every penny. I already plan on coming back here to relive the life of luxury again one day soon. But next time I think I will convince my friends from home to join me for the next trip out here. It was a little sad to be leaving paradise, but also bittersweet. 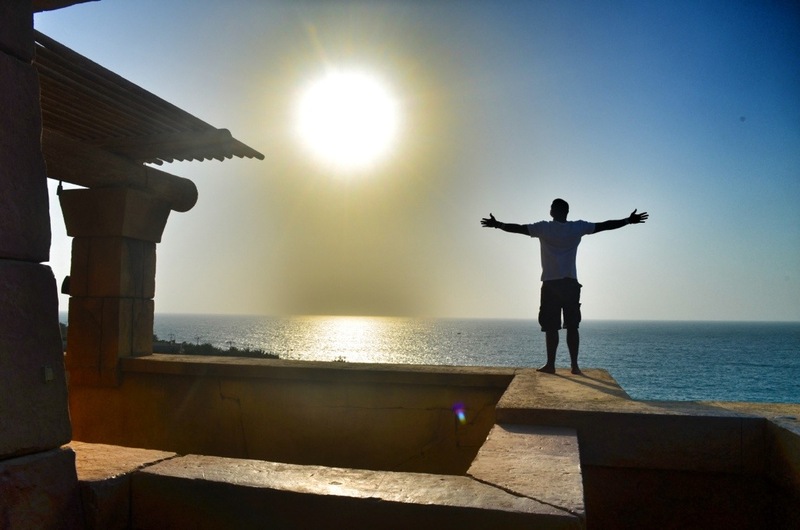 What’s great was that the next day, we would be headed to Morocco! But what sucked was the time we would be leaving…5 am in the morning! We didn’t really go to bed early either so this journey to Morocco was going to be a drag, but I’m sure the effort would be worth the price! Whenever I book a hotel for anywhere, I like to make sure breakfast is included. It’s always comforting to wake up knowing there’s a full breakfast buffet waiting for me. The Auris Plaza was no exception. We woke up and immediately went downstairs to the lobby where servers were waiting for us. We walked into the dining room and just like I imagined, everything was laid out for the taking. We had our choices of a variety of fruits, meats, waffles, yogurts, CEREALS, juices, eggs, and all sorts of foods I never seen before. But to be honest, Chris and I weren’t terribly hungry. We were still stuffed from yesterday. 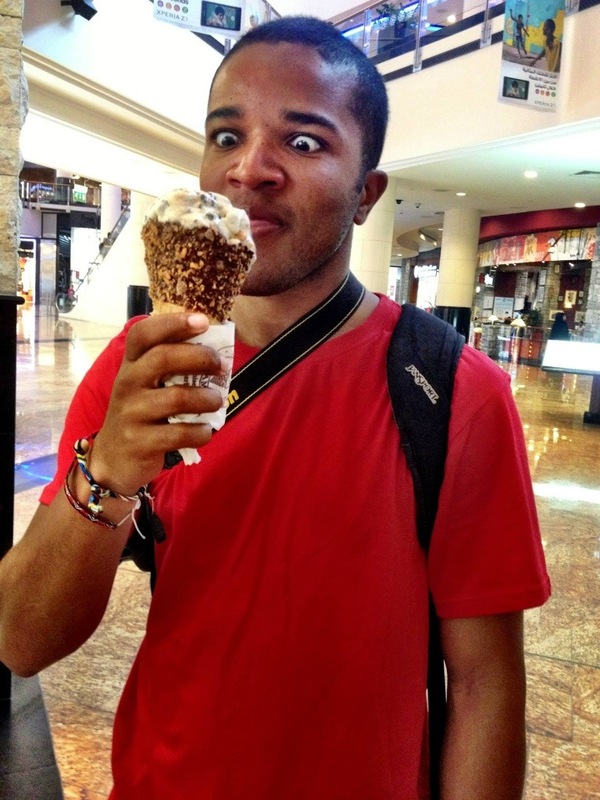 Me specifically from all the ice cream and chocolate cokes I had. We only ate a small portion of breakfast though but were satisfied. We went back upstairs and went over a rough game plan for the day. 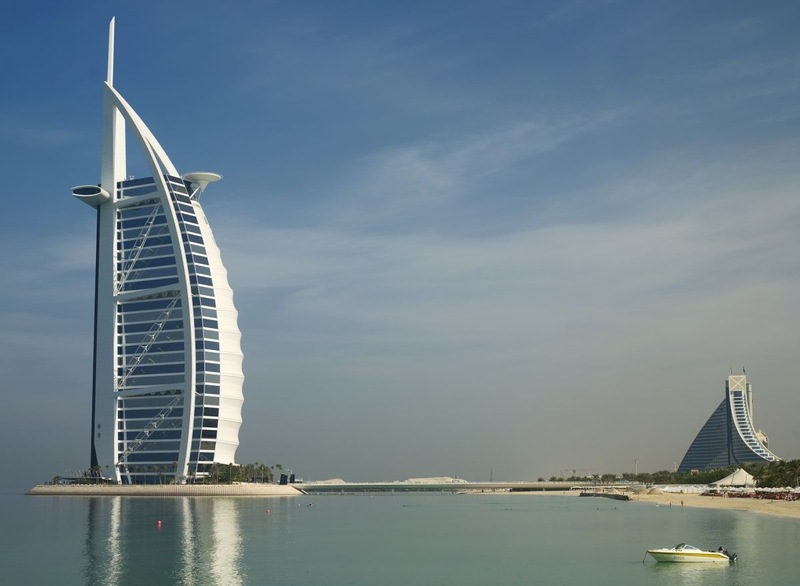 From our hotel, you could see the Burj al Arab, one of Dubai’s most iconic pieces of architecture that sits on Palm Island. We figured today we could head in that direction and go to the beaches nearby and see whats there. We took a cab to the Burj al Arab and found that we needed a reservation to actually get inside the building. Bummer. Instead we walked to a hotel nearby called the Jumeriha Hotel and went inside, just because. 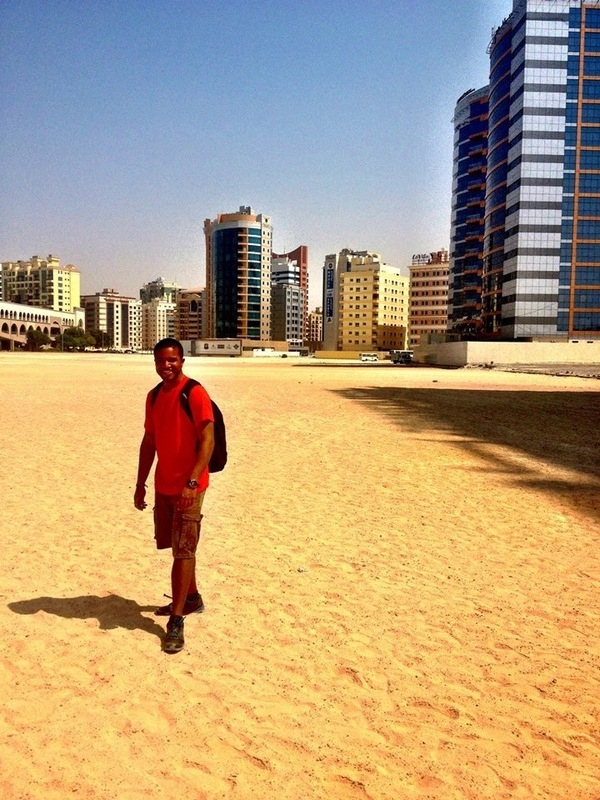 They had access to the beach but it would cost us 200 Emirati dirhams each! No way! We asked a lady there, how we could get to the beach for free and she pointed us in the direction which was five minutes away. We walked outside in the blistering heat for a few minutes before we finally arrived to the ocean. The water felt fantastic and there were waves sweeping by every few seconds. 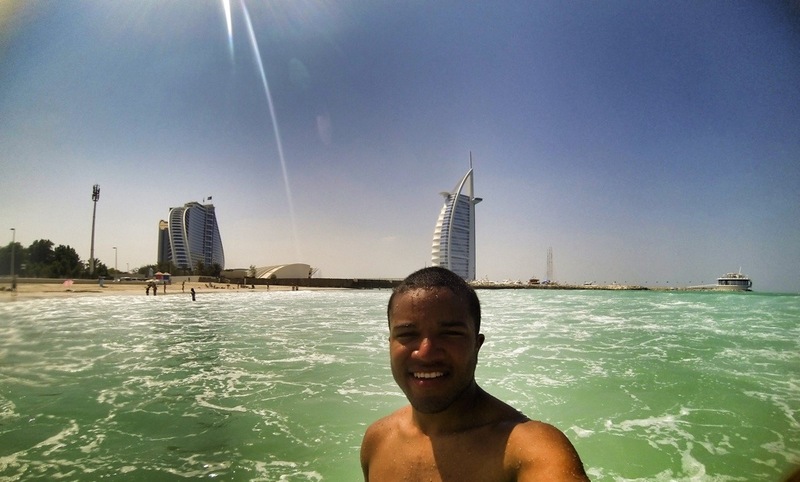 It was right near the Burj al Arab which created a nice backdrop for our swim. We busted out the GoPro and recorded videos of us gliding on top of the waves. The ocean gave us a hankering for more water activities. We knew there was somewhere along the beach where you could jet ski, we just didn’t know where. After about an hour we decided to try and find something and thought the Dubai Marina sounded like the spot to be, so we took a cab there. The Marina was filled with restaurants and bars, but no sight of any water sports. We went to a Tim Hortons nearby to use their Wi-Fi to find out what kind of water sports were near by. We found a couple of jet ski sights but they weren’t really anywhere near according to the map. On the map I noticed the man-made island called Palm Island was right next to us. I had no idea Palm Island was in the shape of a palm tree! 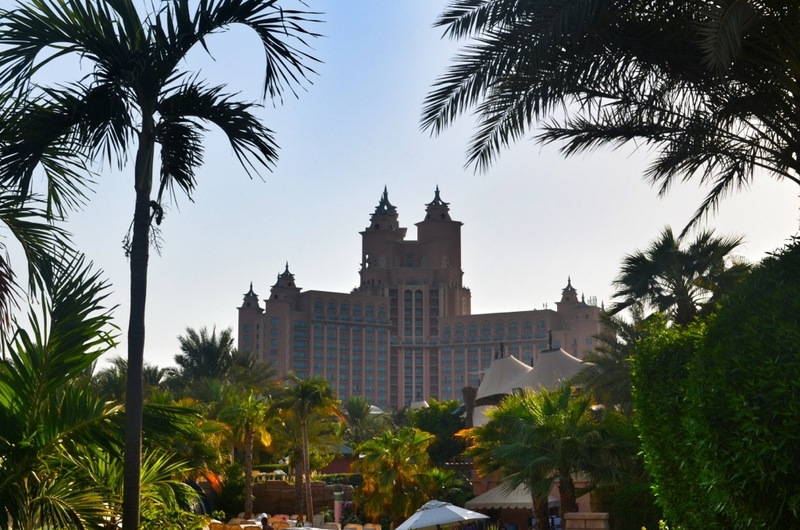 I also noticed that Atlantis, one of the best hotel resorts in Dubai, was on the island. 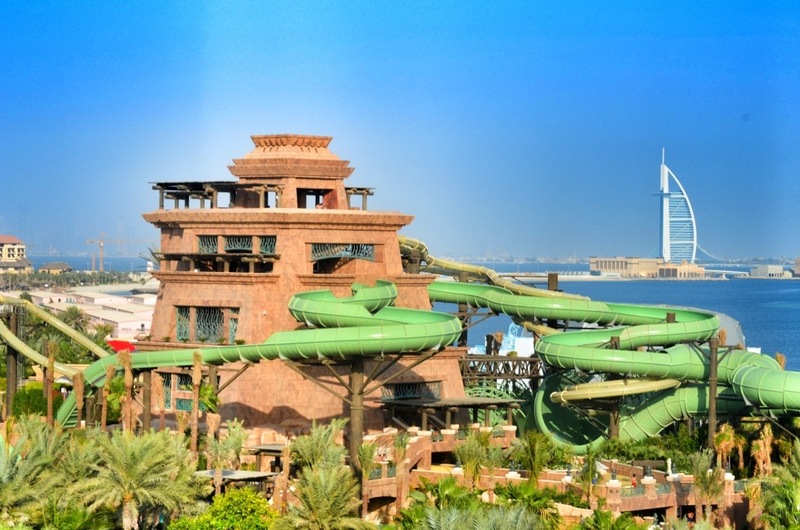 The Atlantis is home to the Aquaventure Water Park, one of the top water theme parks on the planet! I ran the idea by Chris to go there instead of wasting our time trying to find a jet ski. It would also be cool to be on the awesome man-made island. He was on board, so we got on yet another taxi and set off for Atlantis! As soon as we entered the island, the landscapes changed. There were hundreds of buildings that grew symmetric in interesting shapes and designs on each “palm” of the island. The island was more expansive than I initially thought and a sight to behold. You know how dogs get a kick out of hanging their head out of the car window with their tongues hanging out? That could of been me if I really didn’t mind looking like a crazy person in Dubai. The views all around were incredible! We eventually pulled up to Atlantis at the top of the island. We walked through the hotel, through the mall area to the entrance of the Aquaventure Water Park. We bought our day pass and locked everything except for my GoPro in a locker. We got there around 2 pm, which meant we had about four hours to squeeze everything in before the park closed. The water park was humongous! The whole park of Atlantis had a theme of an ancient desert empire built of stone towers and pyramids. 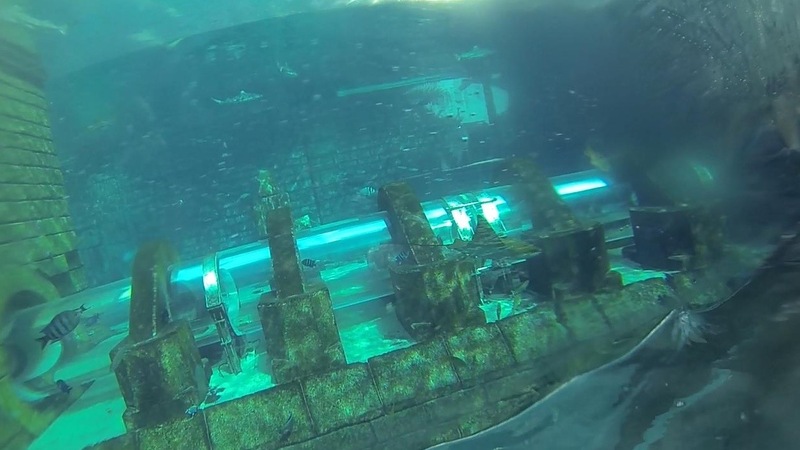 Through Atlantis, a river flowed that sprouted in different directions which lead to different areas of the park. This river was the Lazy River that could take you just about anywhere in the park. 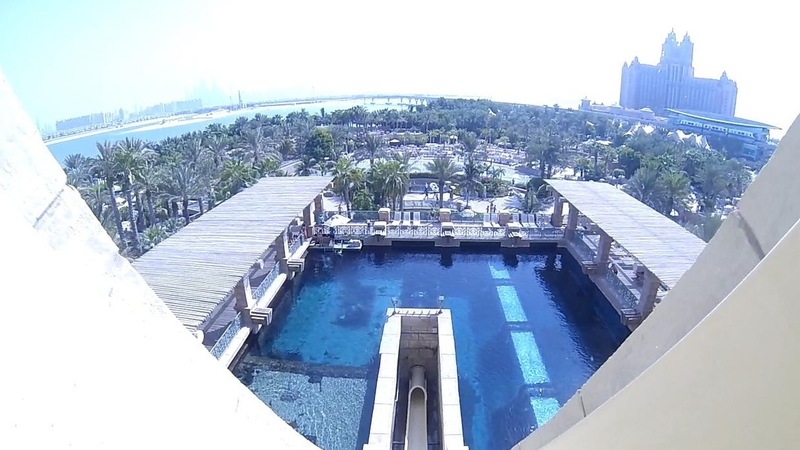 Atlantis was filled with palm trees that covered two main areas for water slides. One area had the shark tank aquarium. Above the aquarium was a towering structure that claimed home to a few different water slides and rides including the “Leap of Faith”. Wanting to get our thrill fix in right off the bat, we headed to the very top of the tower for the Leap of Faith. 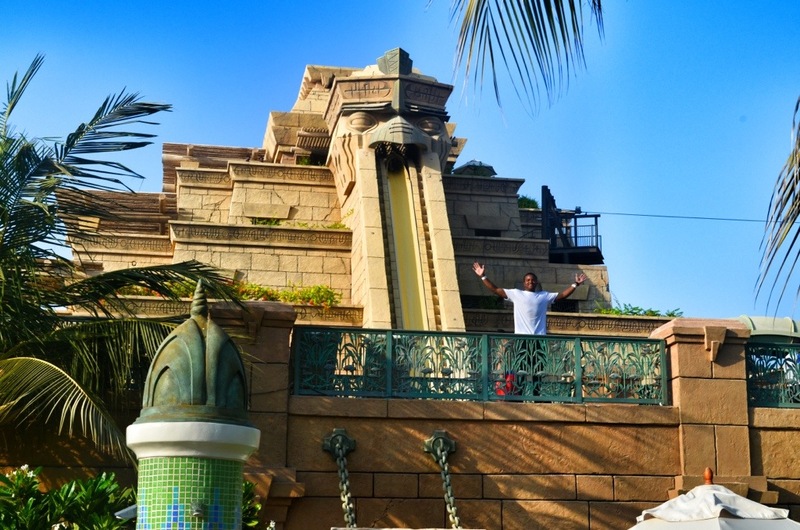 The Leap is essentially a water slide on an almost completely vertical slope that gives you the sensation of free falling! Eventually, the angle of the slope would decrease until you eventually slid into the pool at the bottom. 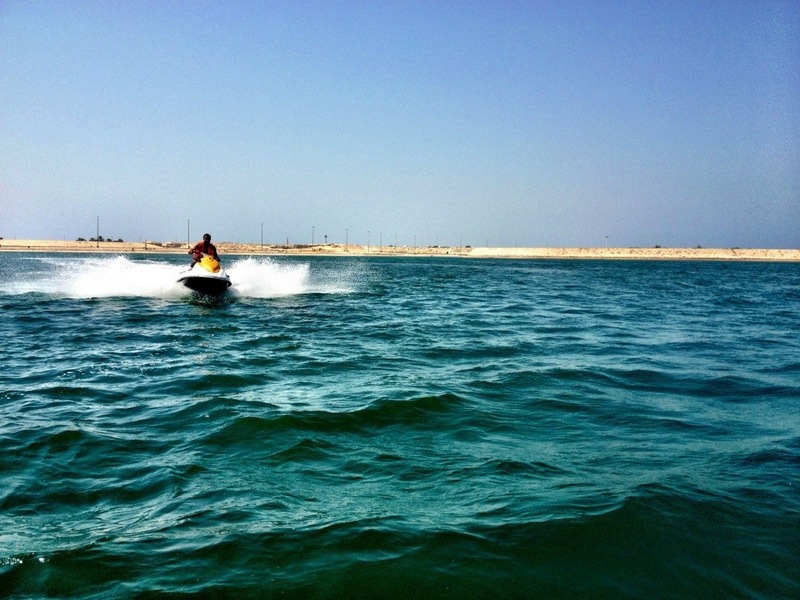 It was extremely fun but it was hard for me to keep my eyes open because I was going so fast and water kept splashing into my face. Fortunately, the GoPro recorded everything! We took turns using the GoPro to record our rides and slides. We went on the Leap of Faith multiple times before we tried other slides on that tower, which were fun in their own right. What was cool was, we didn’t really have to walk much anywhere; many of the slides would drop us right into the lazy river, which we used to get to other areas in the park. We went to the other tower in a different part of the park that contained one of the newest thrill rides called “Poseidon’s Revenge”. The name alone sounded amazing. Chris and I literally ran like kids to the top of the tower. It was a water slide that I’ve never seen before! Basically, you are placed in a transparent cylinder tube. The ride operator closes the tube so you are trapped. All of a sudden, you hear a woman on a speaker countdown “3…2…1…” and instantly the floor beneath your feet drops open and before you know it, you’re plummeting at rocket speed into dark watery depths! You are going so fast that you never realize that you’re going through loop-de-loops until you eventually burst out into a water slide all the way at the bottom. I was worried I would lose my GoPro on this one before going in but I held a tight grip the whole way. This slide was awesome! We went onto the other slides of this tower afterwards. One was called the “Slithering Snake” which was a narrow tube slide that wound round and round into a pool at the bottom. Another ride called the “Aquaconda” put us into a large tube with a couple other patrons, as we slid around on a huge water pike. It wasn’t long before we returned to Poseidon’s revenge for another go…and then another go right after! It was great! We took the lazy river back to the other tower to get on some of the less thrilling rides we passed up earlier on. One ride had us in tubes that took us through a tube that went through the shark tank aquarium. We spent a good chunk of time just riding as many slides as we could before we grew hungry, of course. But before we left the park, we wanted to go back to the locker room, grab our regular cameras, and walk around to take pictures. 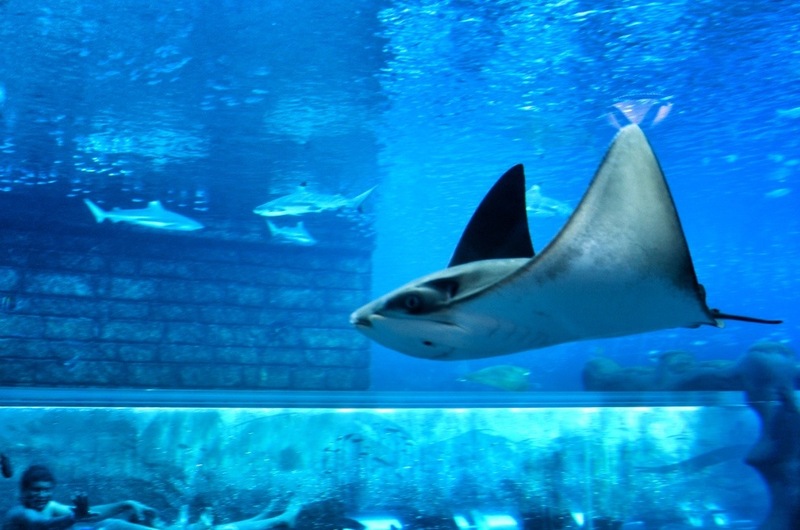 There were many great places in Atlantis to eat but we decided to head to another attraction in Dubai to grab dinner, to the biggest mall in the entire world – The Dubai Mall! We grabbed a taxi that eventually dropped us off at one of the biggest complexes I have ever laid witness to with my own eyes! The entrance to the mall was like a hotel, where valets waited to take guests cars for them, including this sleek red Lamborghini. 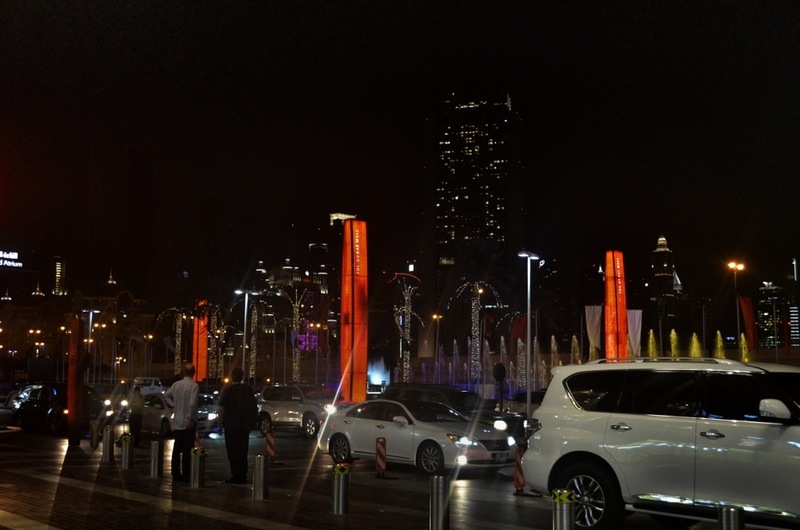 As we entered, we saw signs directing to the Dubai Fountains. 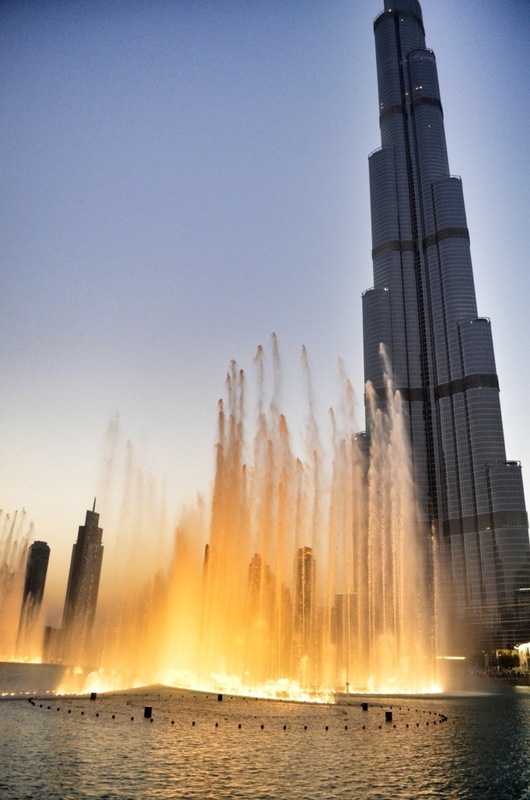 The Dubai Fountains, from what I heard, is a water show that takes place every 20 minutes after 6 pm at the fountains of the mall. It’s reminiscent of the fountains at the Bellagio in Las Vegas actually. Before we found a place to eat, we decided to head there since it was almost 6 o’clock anyways. We made it early enough where we had a perfect view of everything. We were right in front of the tallest building in the world, the Burg Khalifa! Seems like Dubai has the biggest of everything in the world doesn’t it? Soon, a couple minutes after six, the show began. Arabic music played in the background while the fountains danced away. It was a quick show that I would say was on par with the Vegas offering. Afterwards, we were still starving and beelined straight to the food court! On the way there, I spotted my ultimate guilty pleasure…Cinnabon! I made a detour there and ordered up a classic cinnabon and ate it on the way to the giant food court, which had just about every restaurant you could think of and then some! 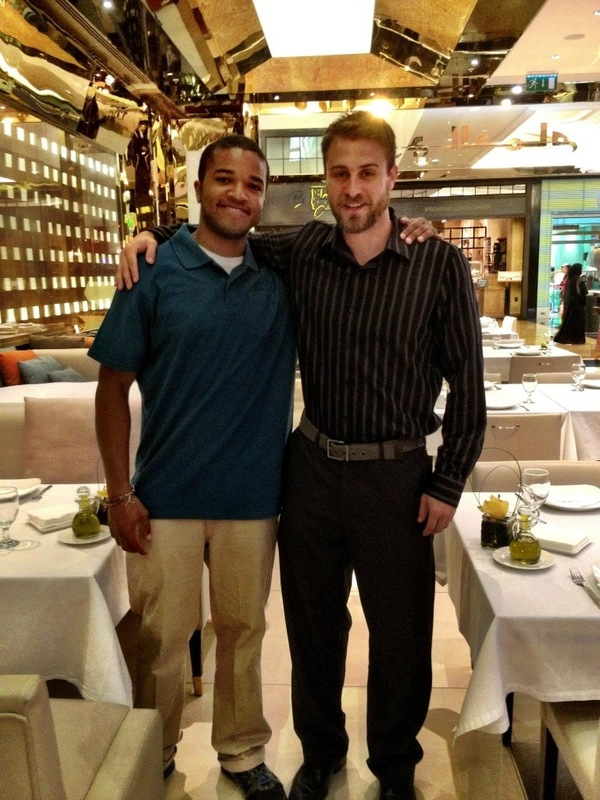 We eventually chose an Italian restaurant where I ordered up a nice chicken alfredo pasta and Chris ordered a pizza. We stuffed our stomachs to the max! We decided to head back to Auris but getting out of the mall became a challenge in itself! It took us forever to find the exit with the taxi rank! 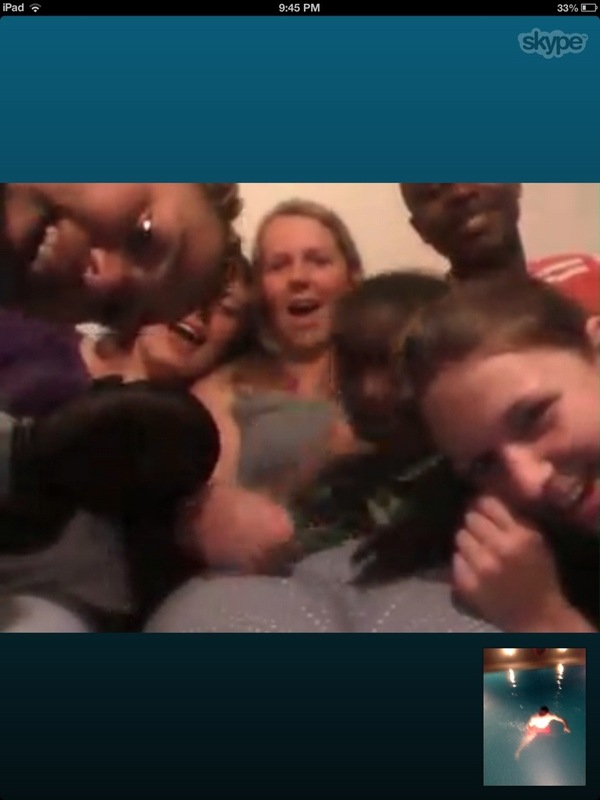 Once we got back to Auris, we had set up a time to Skype with Hanneke and Mieke back in Kayamandi. A nice surprise was that RiRi, Mawande, and Buscha were also there during the Skype session and they were able to chat with us as well! The reception was wishy washy, but we were able to give them a brief tour of our hotel, including a water show performance Chris put on for them. After sometime on the roof of Auris wandering about, we went back to our room and called it a night. Today has been the best! We had no idea what we would do tomorrow but all we knew for certain was that it would be a good time regardless of what we did. 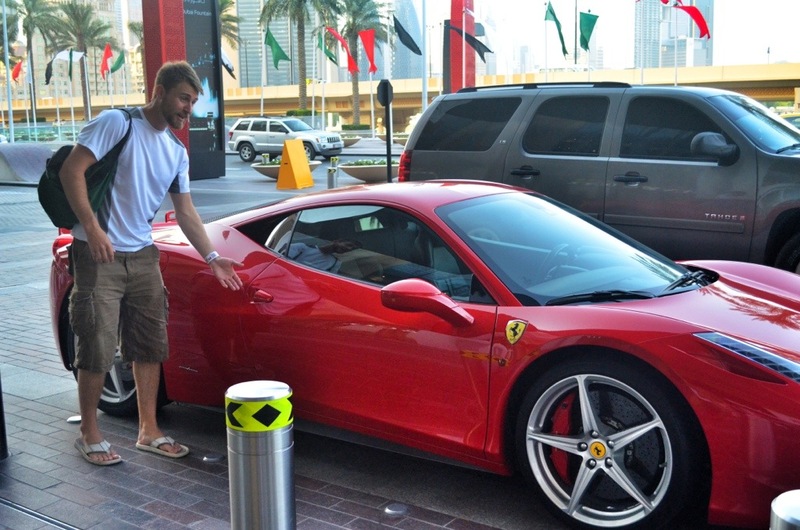 So far, Dubai has exceeded all of my expectations! Way back in February or March of this year when we booked the initial trip to South Africa, Chris and I thought that it would be cool to book a ‘trip within a trip’ to another country or two while we were in South Africa. We had the world at our fingertips and our options were limitless! We debated and threw around potential countries like Turkey, Germany, and Madagascar. 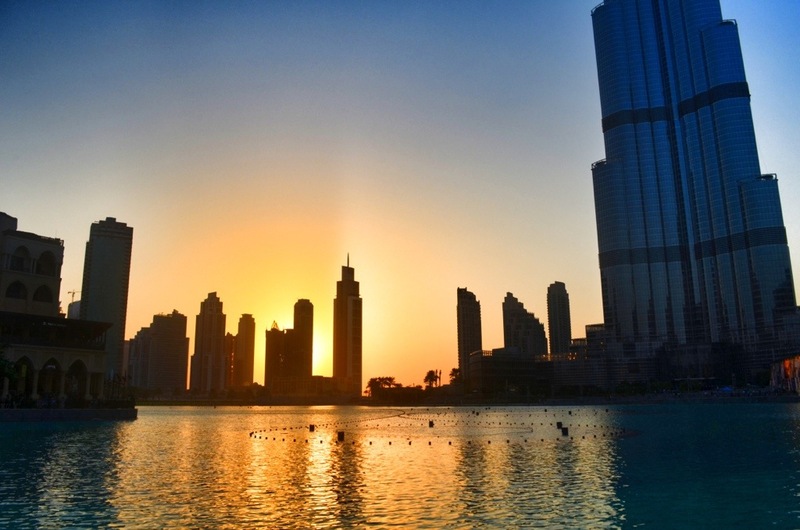 All were great options but we ultimately chose Dubai of the United Arab Emirates and Morocco. Dubai was Chris’ top choice and Morocco was mine. We had the two countries over the course of about three weeks. I was looking forward to this time even still when I was in Southeast Asia! Chris knew what countries we were going to, but thats pretty much it. I left him clueless about accommodations and what exactly we were going to be doing. I get a kick out of surprising people with good things and this was no exception. I hired a taxi driver early on Monday, October 7th and he took us to the Cape Town Airport. Thankfully, we had a direct flight to Dubai which would be around an eight-hour journey through the Emirates Airlines; one of my favorite airlines I have ever been on! I already wrote about why I love the airline so much on a previous post, so I won’t get into that again. On the long flight, I ended up watching a few episodes of The Big Bang Theory, World War Z (which is nothing like the book! ), and Oz: The Great and Powerful. I tried to watch The Man of Steel but the beginning part of the movie took way to long and I zoned out. Plus, in the canon story, Clark Kent and Pete Ross are best friends. In the part I saw in the movie, they were pretty much enemies! Thats when I turned it off. I’ll give the movie another go sometime when I get home. Anyways, before I knew it, we finally landed at the Dubai airport! We landed around 1:15 am, a horrible time to arrive anywhere! While in Cambodia, I booked a pretty sweet five-star hotel in Dubai called the Auris Plaza, but we couldn’t check in until noon! I told Chris we would have to crash at the airport until the morning. I didn’t give him a reason why as not to spoil the surprise but just told him we have to! He rolled with it and we found a spot at a Burger King to chill out. It was almost 4 am and I still couldn’t really relax nor sleep. If I didn’t sleep now, then I would be sleeping the day away in Dubai, which I did not want to do. Maybe I can ask the hotel if it’s possible to get our room early? I woke Chris up and told him “Let’s go”! I caved in and informed him that I booked a hotel for us but we couldn’t check in until later. Even if we couldn’t get our room early, I’m sure their lounge would be better to sleep in than a booth at Burger King. We found a taxi outside and I asked him to take us to the the Auris Plaza, which was about 25 km away, right behind the Mall of The Emirates. Driving through Dubai is just like I imagined; tall, magnificently built sky scrapers and bright lights everywhere. It kind of reminded me of Las Vegas. Anyways, we pulled up, grabbed our bags, and walked into the very ritzy hotel. It looked just like the pictures! I told the front desk about my reservation and asked if there was anyway possible way we could get our room now. Thankfully, he was such a nice guy and was able to get our room for us. Music to my ears! I could sleep! We were on floor 13, room 1322. We walked into our spacious room to the sounds of enchanting Arabic music playing on the tv with a welcome screen that read “Welcome Daniel Sellers. We hope you enjoy your stay.” How classy! I certainly will enjoy my stay! Neither of us went to sleep on the flight, so we almost immediately passed out. We woke up around noon a few hours later in complete darkness. I woke up and opened the curtains and was instantly blinded by the light outside. It was time to get up! We both could of slept longer but we didn’t want to waste our day away. 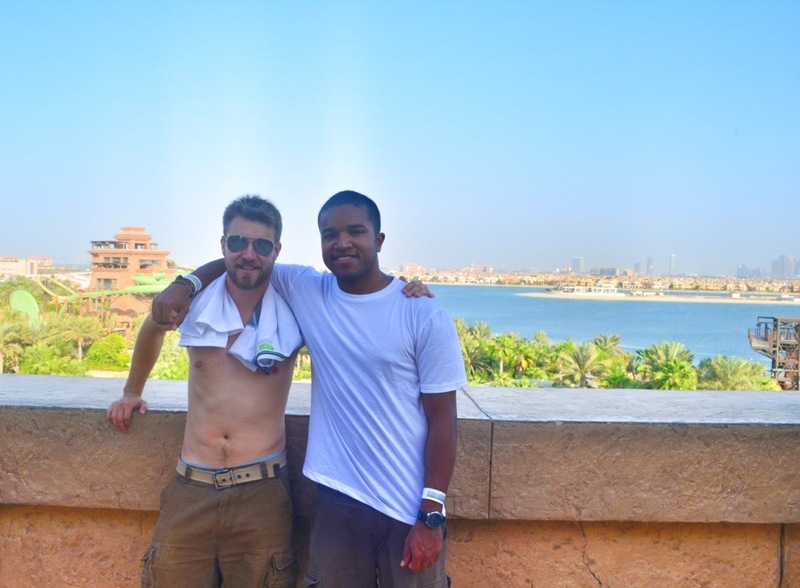 Chris has always assumed that I had everything planned out for Dubai from the get go, and initially that WAS my plan. But I thought it would be better if we decide as a team instead of me picking everything. What if I booked something he didn’t really like? I let him know all of the cool things we could do and that we should start off the day by going to Ski Dubai at the Mall of the Emirates. 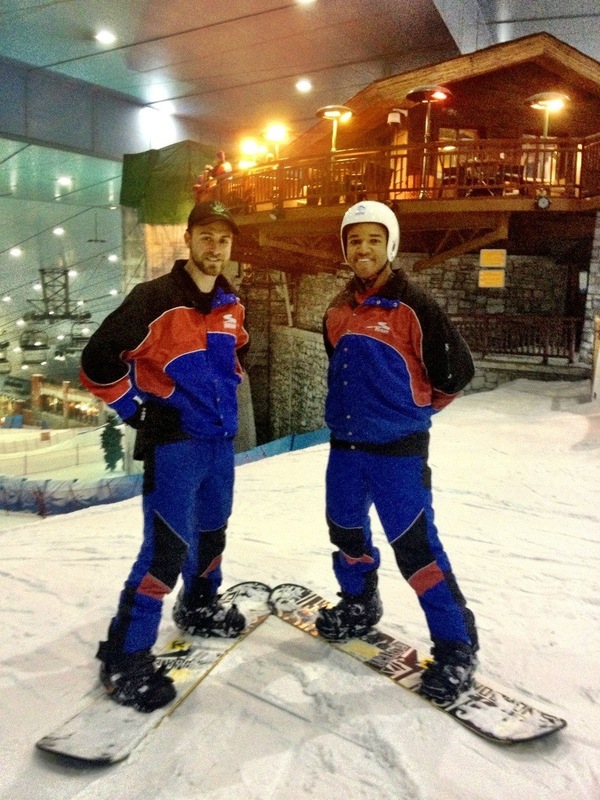 Ski Dubai is an indoor, man-made snow hill where you can ski and snowboard down a few slopes. What better way to spend our first day in the desert than by going snowboarding! 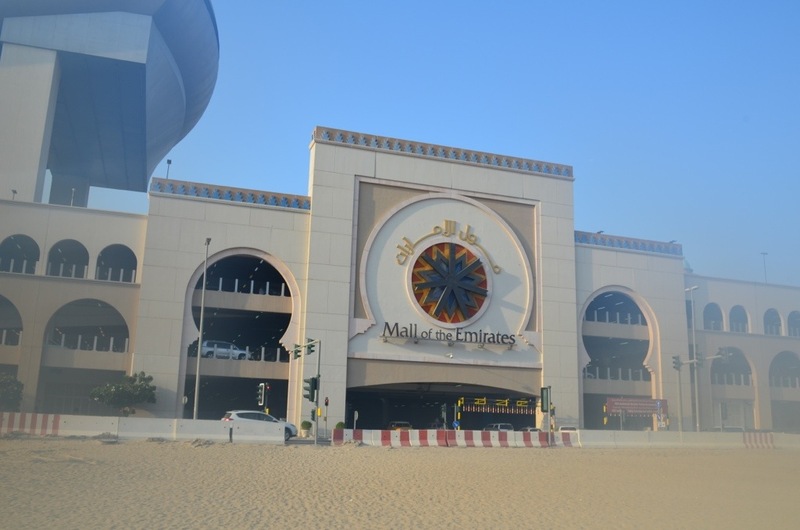 The Mall of the Emirates is the second largest mall in Dubai and is a five minute walk behind our plaza. Man was it hot out there! I didn’t mind the heat too much though. We were in the desert, so the heat was expected. On the brief walk to the mall, I found my shoes had sand in them. This would happen everyday here actually. But it wasn’t long before we stepped inside the huge, air conditioned mall. 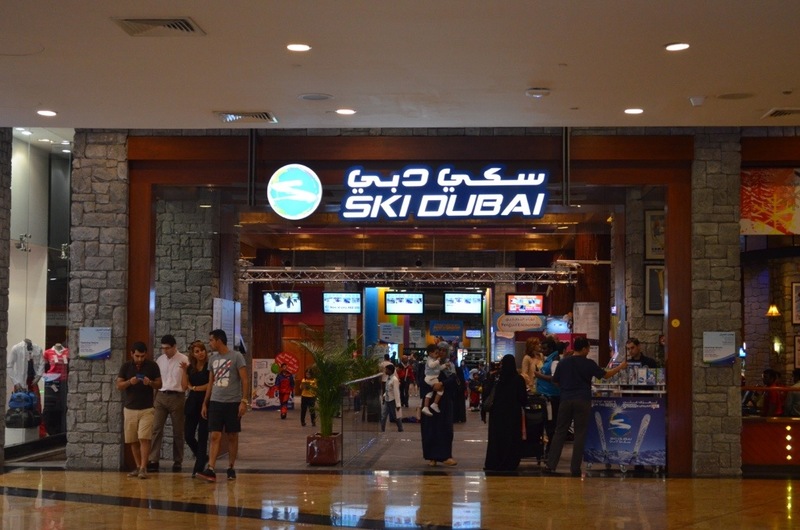 We found the Ski Dubai place inside and went and got our gear! We had jackets, snow pants, boots, socks, and a rental snowboard in tow. It was crazy to think we were about to snowboard in the desert! We got a two hour pass and if we wanted more time, we would just extend it later. We walked to the inside of the ice arena and suddenly we were in a whole other world! A massive slope filled with artificial snow. Ski lifts streamed through the air to the peak. There were even cabins, lodges, and pine trees scattered about to give the feeling of being on Colorado’s famous hills. It was awesome! However, of all the life threatening things I do in my life, snowboarding would be the one most likely to kill me! Its been a few years since I last attempted to snowboard and it was for good reason; I had a horrible experience last time. Snowboarding is fun, I’m sure, but I could never figure out how to control my lighting fast speed and I could never stop properly. Back home in Michigan, I braved one of the biggest slopes nearby. I went at a super fast speed, not by choice, only because the board fully controlled me and not the other way around. I ended up going so fast where I had to leap over the wooden gates at the bottom because I didn’t know how to stop. That resulted in me tumbling to my potential doom through nearby trees and mounds of snow for what seemed like a whole minute. I wasn’t wearing a helmet. My head was in serious pain. It could have been a lot worse! 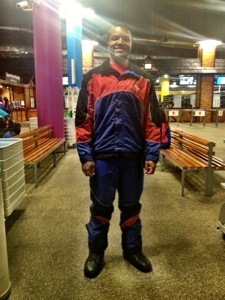 Ever since that debacle, I haven’t tried snowboarding again. I was a little nervous going in, but thankfully there was a bunny hill I could practice on with all the other sucky people. I went down the hill and went fast and straight just like I remembered. The only way I could stop was to fall over, also just like I remembered. I wasn’t liking this one bit to be honest. But anyways, we decided to take the ski lift up to the bigger hill, just because. On the way up, I grabbed a helmet because I felt like something bad could and would happen to me. We made it to one of the summits and I watched Chris go down first and he made it to the bottom with relative ease. I stared at the hill for a minute or two before I decided to walk back down. Too many flashbacks of my last incident kept playing in my head and I shouldn’t have come up here when I couldn’t even master the simple bunny hill. Chris wondered what happened. I told him I didn’t feel confident and wanted to practice on the bunny slope some more. It was a great decision on my part because at that same time there was a couple getting a beginners lesson there. I watched and paid attention to what they were doing and had a free lesson! In about twenty minutes, I learned how to control my speed, turn at will, and how to stop properly! My confident took a significant boost and I felt brave enough to attempt the bigger slopes. So up we went! I’d like to say I went down the big hill without falling, but then that would be a lie. I fell once in the middle. But that’s it! I tried numerous times afterwards and made it down without falling over and with proper stops. My love/hate (mostly hate) relationship with snowboarding has turned into a whole lot of lovin’! We continued to snowboard for the next couple of hours before we realized how hungry we were. We haven’t eaten anything all day! 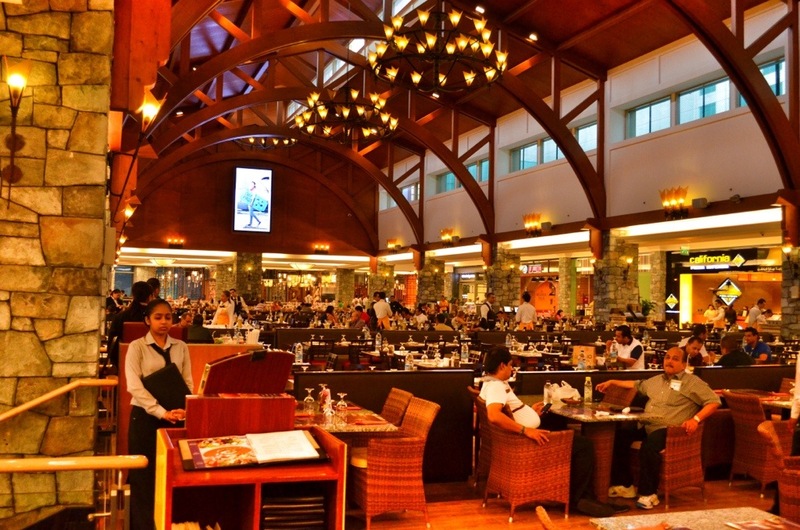 Luckily for us, there were tons of restaurants to choose from in the Mall of Emirates. Our taxi driver who took us to the Cape Town Airport has been to Dubai and suggested we go to a restaurant called Japengo’s. He said the food there is of great value, tastes amazing, and has plenty to offer! We reached the food court and found Japengo’s and pigged out on a delicious hamburger, chicken sandwich, and fries. We both felt like happy fat kids and went back to our hotel to relax and digest for awhile. 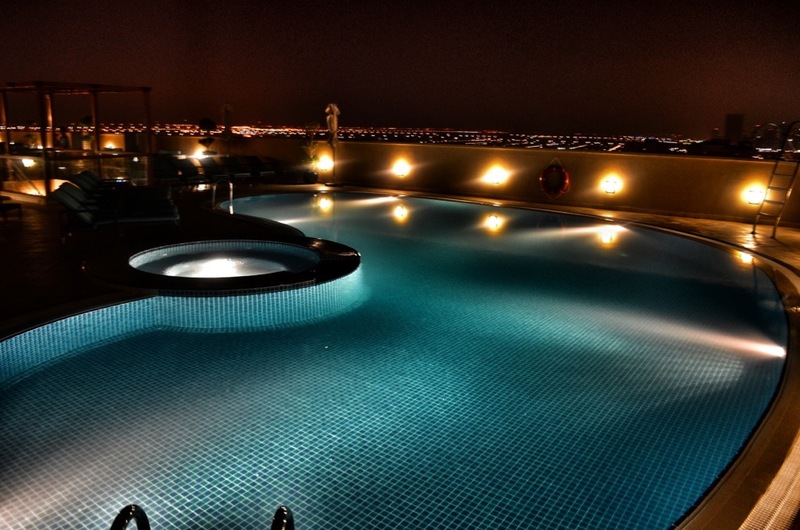 We decided to check out the pool and spa that was on the roof of the hotel. 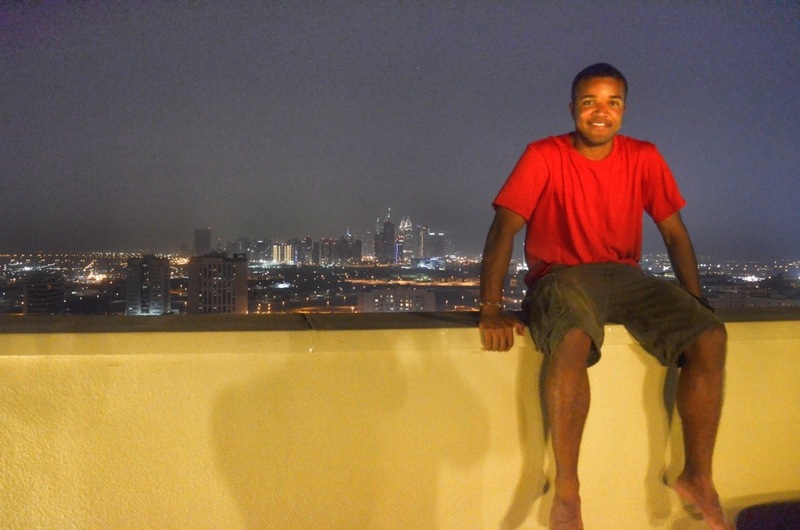 From the roof, we had a great view of Dubai sitting in the dusty orange horizon. The sun shines bright almost permanently everyday here. Today was no exception, as it was still quite hot out. So we jumped into the pool! It was a little warm, but went to about 12 feet deep or so. We wanted to investigate the spa so we went into that area. The hot tub had lights inside that changed colors, the steam room was the hottest room I’ve ever been to in my life, and the sauna was your typical average sauna. It was a great place to cool down and relax your muscles, especially after spending all afternoon attached to snowboards. 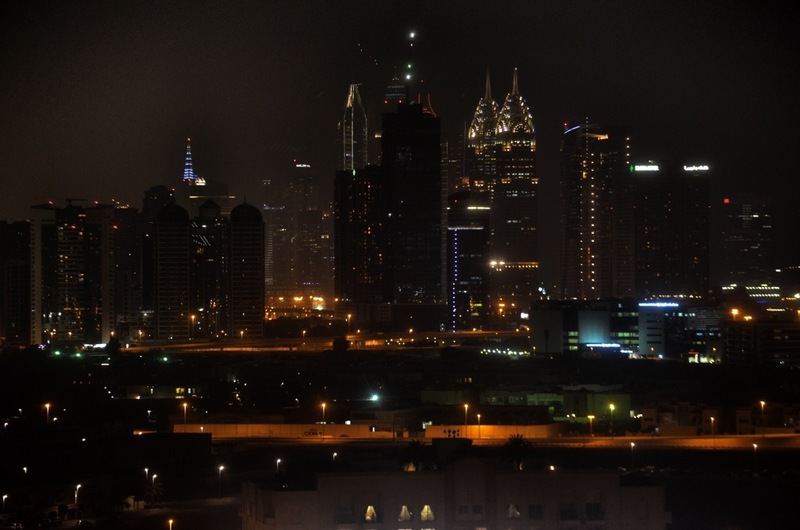 Once night fell, Chris and I returned to the rooftop to enjoy a traditional Arabian shisha. A shisha is otherwise known as a hookah and it’s everywhere here in Dubai. I never had a shisha before, but it was suggested I try the grape mint flavored one. It was a good choice. It didn’t taste horrible. The whole time, we were both taking pictures and talking about how great chips and salsa sounded and how we both needed some. There was a Chili’s at the Mall of Emirates we saw earlier that we were pretty sure had chips and salsa. So like the fat kids we were, after the shisha we went back to the mall and into the Chili’s. We ordered our chips and salsa, along with fried mozzarella sticks and a chocolate coke for myself. Yes, you read that right – CHOCOLATE COKE! I think it must be coke with a little bit of chocolate sauce stirred into it. It actually didn’t taste bad! I’ll be sure to try it again when I get home! One thing about staying in a nice hotel, is looking forward to going to sleep in your big cushy bed! I was looking forward to it all day especially after how little sleep we got last night. Chris wondered what we would do the next day. I didn’t have anything booked at all, but I suggested we set our sights on going to the nearest beach and starting from there. 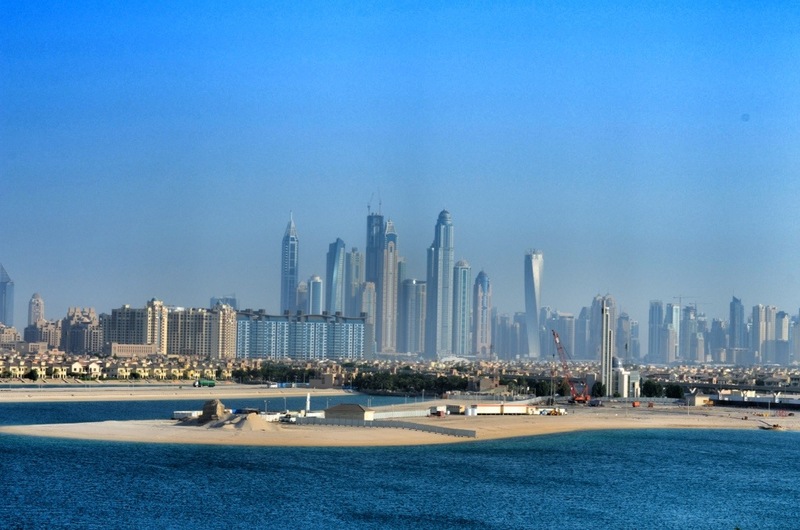 From our hotel we could see one of the famous land marks in Dubai sitting on one of the man-made islands. I think that would be a great starting point for the morning! 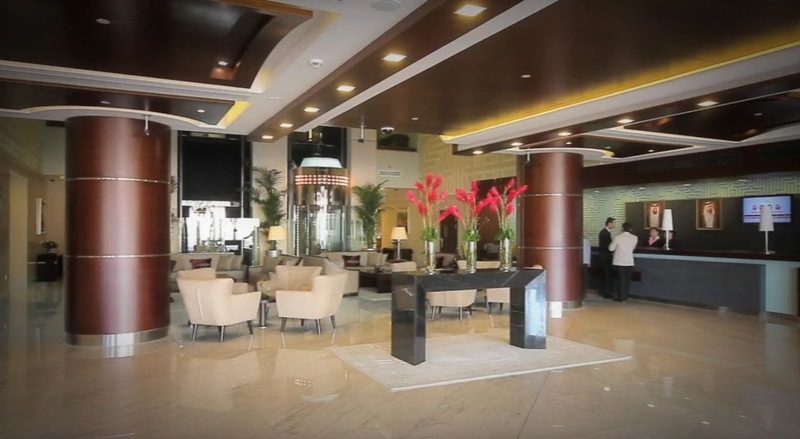 Auris Plaza HotelDubaiMall of EmiratesSki DubaiU.A.E.